Taking advantage of observations from the Hubble Space Telescope, researchers provide evidence of what could be the first exomoon – a moon orbiting a planet outside our solar system. While the authors were rigorous in their evaluations, they caution that their results must be confirmed by subsequent work. Recently, NASA's Kepler space telescope surveyed for moons in a sample of 284 transiting planets – planets that pass between a star and an observer, resulting in a momentary dimming of the star's light. The data suggested that a Jupiter-sized planet, Kepler-1625b, may be orbited by an exomoon. Based on this promising evidence, Alex Teachey and David M. Kipping requested and were awarded 40 hours of time to observe the transits of this planet using the Hubble Space Telescope (HST), which is about four times more precise than Kepler. Studying the transits helped the researchers look for two signals that would be suggestive of an exomoon: a reduction in the star's brightness as a potential exomoon passed in front, and the gravitational effects such a moon would have on Kepler-1625b – for example, in altering its transit start time. Both signals show up in the transit shape. About 3.5 hours after Kepler-1625b's transit completed, HST recorded a second smaller decrease in the star's brightness, a dimming indicative of a moon "trailing the planet like a dog following its owner on a leash," Kipping said. To better confirm the likelihood of an exomoon, further analyses of the HST observations were needed, as was use of refined Kepler photometry data, say the authors. This is because any model of a moon must account for every transit event that has been observed (here, that included transits already observed by Kepler). The researchers' investigations showed that the HST-recorded transit of Kepler-1625b occurred nearly 80 minutes earlier than expected, a pattern suggesting the presence of transit timing variations, or TTVs, which are among the first proposed methods to confirm the presence of exomoons. The researchers note that in principle this anomaly could be caused by the gravitational pull of a hypothetical second planet in the system, although Kepler found no evidence for additional planets around the star during its four-year mission. 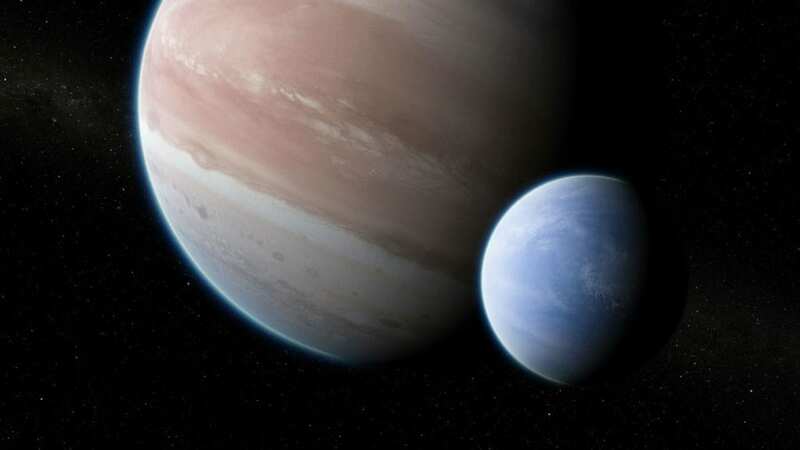 While the authors caution that their results must be confirmed by subsequent studies, the moon of Kepler-1625b ultimately could be the first confirmed exomoon.